These drawings are an imagined, fixed glimpse of photon particle interaction on the smallest scale of quantum mechanics. Each drawing can be viewed as an external or electromagnetic field, where a light matter interaction creates a visible illuminated mass. Only when they interact with something else they manifest themselves as particles: on our eyes, light can be seen in separate droplets, or as a swarm of photons. Can you tell us a bit about your background and what motivated you to become an artist? Growing up in smaller, rural towns in Ohio I spent a lot of my time outdoors exploring, thinking, reading and often alone. Drawing came fairly easy, that’s how I imagined things, figured things out and it was one of the easiest forms of expression. Creativity was pretty prevalent in my family in various ways and mediums. My grandmother was a painter and played piano by ear. Alongside my grandfather, she curated a local art booth at the county fair each year. My mother is a storyteller, a landscape artist, and seems to have an ongoing vision board of ideas in her mind. My uncle was an amazing make-up artist in both Chicago and New York throughout the 90’s and early 2000’s. I was involved in a lot growing up from different sports, musical instruments, clubs and organizations, but ultimately my involvement with art making made the most sense. I started school in the DAAP program at the University of Cincinnati and moved to Chicago to attend SAIC in my second year of college. That is probably when I committed myself to being an artist. Can you walk us through your creative process? Are there planning stages prior to the final drawings? I spend a lot of time thinking, researching, writing, watching documentaries, and visualizing ideas of ideas before I ever make a mark on any surface. I generally keep a notebook on me for sketching and jotting down any poofs of inspiration that arise during my days. Generally, things begin quite small as drawings or collages and oftentimes remain that way. Other times they become larger paintings, parts of installations or most recently the backdrops for video work. You had a very interesting project titled How to pack an Asteroid on your back, and photos on your website show you going about a number of different daily activities from riding the subway to reading in the park and sunbathing at the beach with an enormous black asteroid backpack. Can you tell us more about this project and how it fits into the rest of your work? How to pack an Asteroid on your back is a wearable sculpture that I created in the summer of 2016. I had been working on a series of paintings titled, HLWA- How to live with Asteroids. I had so much fun painting them that once I completed the series I just wanted more Asteroids in my life. I decided that actually living with one was a natural next step. I created this backpack idea so that I could bring the Asteroid with me while I went about my day, wether I was grocery shopping, riding the train, having a leisurely day reading in the park and several other mundane daily activities. I depict these hypothetical situations, in real life and in my paintings in which Asteroids descend and we must learn to co-exist with them. In these space-like realities, the Asteroids act as metaphors for things, people, and ideas that we simply do not interact with, or avoid in our everyday existence. They become the main focus, they take up space, are from space, ultimately obstructing our line of vision and invading our personal space. My work tends to merge art and science in a way that challenges and exposes our limitations of human understanding. From considering life with Asteroids to being able to see particles of light on the smallest scale of quantum mechanics, I create these interactive relationships between what cannot be seen and what is visible. This piece in particular seems to incorporate an element of humor—is this an important part of your work as a whole? As a whole, hmmmm. I do love humor and generally try not to take things too seriously…so I would say when I can incorporate it into my work I do. You work with a lot of space imagery, when did you begin working with this subject matter and what draws you to it? You know, I’ve been asked this question many times and I think it came about 3 years ago when I was working with balloons in a series of highly detailed graphite drawings. They were personal, intimate, and about our attachments and detachments in relationships. Ultimately the imagery transformed into these exploding balloons which became really cosmic coincidentally. After this annihilation of the balloon, I went back to the form and started to think of it more as a solid rock-like object. I started scanning my drawings and began putting them in these collages of what seemed like deep space or vast dark spaces. I wanted my work to connect on a much bigger level, be more universal, it just felt too personal before. Around that same time I started participating in everything science related, from becoming a member with the SciArt Center to taking a Sci-Art Continuum class at Abrons Art Center with the School of Making and Thinking. The Lower East Side Girls Club did a series of lectures called Free Drinks, Fast Science, where each month an amazing speaker would present for thirty minutes on a journey through the universe. I went to nearly all of them. The more I discovered the more it influenced my work. There is a small bright yellow circle motif which is present in a number of your drawings—does this dot represent something specific? Is it always collaged? In these drawings it is always collaged, it is in fact a hole punched dot adhered to the paper. This dot is a photon, as a particle of light. If we could see them, perhaps this is what they might look like to our eyes. This bright yellow spot has traveled throughout some of my other work as a painted dot or cut-out as larger spherical droplets for some three-dimensional paintings/installations. 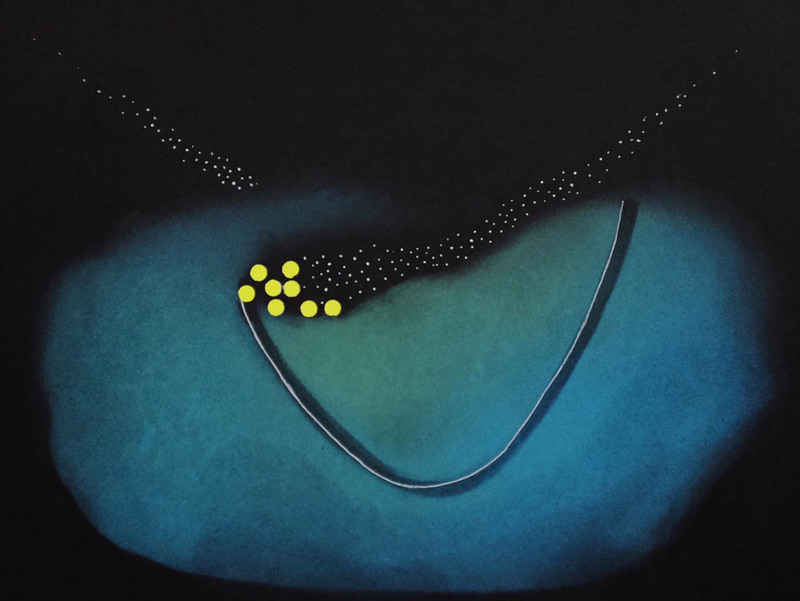 Most recently, it became an animated dot in a video piece I did called Asteroid Horizon. In the print issue of the magazine you wrote of your work: "These drawings are an imagined, fixed glimpse of photon particle interaction on the smallest scale of quantum mechanics. Each drawing can be viewed as an external or electromagnetic field, where a light matter interaction creates a visible illuminated mass. Only when they interact with something else they manifest themselves as particles: on our eyes, light can be seen in separate droplets, or as a swarm of photons.” What initially interested you in this subject matter? It came somewhere after gravity and Asteroids and around the same time as black holes. I had finished a residency in Berlin where I picked up this bright yellow paper that began making its way throughout my work in more ways than just dots. When I got back to New York the collages began. I was working small, on black paper and decided to get some pastels. The photons became the grounding points to the drawings and I wasn’t sure at that time what they were other than some kind light particle. I couldn’t stop making the collages, I guess there are 24 in the series, but I made a lot more than that. It was a continuation of interest really, I was still uncovering so many fascinating scientific things, and I remember focusing on Max Planck and his quantum theory at the time. Well, I can remember early on discovering Kurt Schwitters and wanting to replicate his use of materials in his collages. I also have a book of his Merz fairytales, which is fantastic. I fell madly in love with Peter Doig’s paintings, and around the same time was looking at Luc Tuymans, Michael Raedecker, Dexter Dalwood, to name a few. I was painting a lot of landscapes and interiors at that time. Speaking of humor in work…Martin Creed is ridiculous and I have always enjoyed his approach to art making, not to mention the balloons. I had my own balloon obsession for a while. The drawings and animated films of William Kentridge are something that I find incredibly satisfying and aspire to make today. Everything Louise Bourgeois and Kara Walker. The fascinating worlds and installations of Sarah Sze, Cornelia Parker and Tara Donovan. There are just so many, I am forgetting so many. Who am I looking at now? My contemporaries, my friends, my network of artists near and far. I am inspired everyday and feel encouraged to make work as strong and meaningful as my artists/friends I am connected to. Travel. Living, visiting and working/doing residencies in different cities around the world has been influential, inspirational and beneficial to my work in so many ways. My whole approach to art making changes based on place, accessibility of materials, studio spaces, etc. This way of working keeps things open, fresh, playful and challenging. I have met so many amazing people and have learned so much from being able to take 1-2 months and devote it entirely to working on projects- no distractions, no day/night jobs, just work. My days vary but usually always begin by making coffee and checking emails, going over application deadlines, admin things like that. I like for it to be quiet and reflective, I take my time in the mornings. After that I will go to the studio, or take a yoga class. I try to go to my studio everyday, even if it is an hour or two before my evening job, which I work four nights a week. Otherwise, I try to devote the majority of my days off working on my work in my studio. I try to go to openings, lectures and other art related events on these days as well. If my evening is free I will usually grab dinner and drinks with friends or stay in and read or watch some weird documentary. I’m pretty flexible with most scenarios because I have had so many different ones over the years. Right now for instance, my studio is above a motorcycle shop. I like to have ideas overflowing, things hanging from the ceiling, things coming off the wall, writings and notes taped here and there, Asteroids in the middle of the floor, things like that. Lighting, music and working surfaces are obviously a necessity. Hmmmm, I like my own space. I like to be able to go to my studio and get in the groove, begin where I left off the day before, begin without having to share a visual working area with someone else. It’s a continuation, a flow. Destroying it would be having to share that studio space with someone else, especially if your working styles are completely different and you lack general commonality. So many! Ok, let’s start with Marcel Proust, In Search of Lost Time, and Andre Breton’s Nadja and Mad Love. The ever challenging and difficult Walter Benjamin, essay after essay. Rilke poems. Every word of Patti Smith, but especially Just Kids. The existential crisis I end up having after revisiting Nietzsche. John Berger, Ways of Seeing, of course. Mostly all Vonnegut stories and lately I have been enjoying The Collected Stories of Lydia Davis. Currently, I am reading Hannah Arendt, The Life of the Mind, Stephen Hawking, A Brief History of Time, Nietzsche, Thus Spoke Zarathustra and Edwin A. Abbott’s Flatland. I am always listening to music, and it is all over the place. It depends on my mood, the weather, the work I am making, all things. Sometimes I listen to the same album over and over for a day, week even, it really just depends. But, yes it is a huge part of being in the studio. I like for things to be relatively close to one another, if not within the same space. In the past most of my studio spaces were in a separate room as part of my home. When I moved my studio outside of my home I had to teach myself to get up and go there everyday, but the separation is good. I like working in neighborhoods where walking to a coffee shop, a local bar, stores and general necessities are easily accessible. There is an energy that I try to have access to. Most of the residencies I have participated in have been in a major city, if not the main city of that state or country. I like these places because of their diversity, their ability to attract people from all over the world together. They feel like places that are buzzing with a collective creative energy. Remembering that things take time. Remembering that everything is a series of efforts and events, so pour as much as you can into each of them. I also try to remind myself that everything is temporary and that remaining present in the present is important. Social media is weird. I generally try not to spend too much time on it, generally…however Instagram has been a platform of ongoing love affairs. It’s funny, I have connected and fallen in love with so many artists and their work on Instagram. It’s pretty wild how the majority of the time you will probably never meet this person but feel so strangely connected. Now, there have been other times when I have had the opportunity to meet them in person and that is equally as wild! We usually just naturally hug each other, its a beautiful thing really. So, there might still be some magic in there, in that platform. Let’s see, I love reading, anywhere really, but it is particularly nice to do in the summer in the park. I ride my bike everywhere I can, being mobile is important to me. I am very, very interested in gin martinis and orange wine, and enjoy pairing them with long conversations with friends. To find out more about Heather and her work, check out her website.